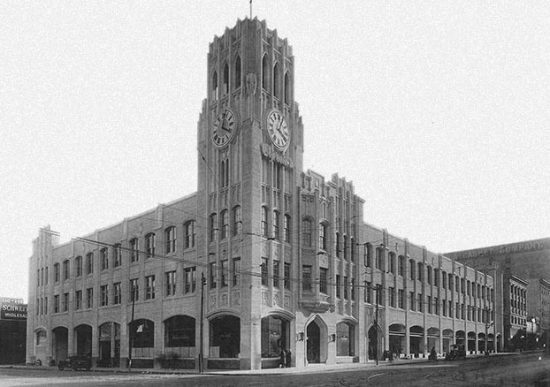 Forest City has announced that it is moving forward with a plan to build a residential and office complex on four acres around the San Francisco Chronicle building, a 1924 structure located on the corner of 5th and Mission streets in the South of Market (Soma) neighborhood. The developer published the Environmental Impact Report (PDF) for the plan, known as "5M," last Wednesday and presented it at a public hearing of the city's Planning Commission this week. The design team for the project includes architect Kohn Pederson Fox, urban designer SiteLab, and historic resources consultant Architectural Resources Group. According to the EIR, the project would contain about 1.8 million square feet of development, presented in two different options. In the "Office Scheme," it would include about 870,000 square feet of offices, 800,000 square feet of residential, and 150,000 square feet of active ground floor uses. In the "Residential Scheme," it would include about 600,000 square feet of office uses, 1 million square feet of residential, and 150,000 square feet of ground floor use. In either scheme, the plan would renovate two existing buildings (including the Chronicle Building), build four new buildings, and demolish six existing buildings. On its web site, the developers call for "carved buildings," to add visual interest, "sculpted high rises," a careful balance of uses, and a pedestrian experience enhanced with active storefronts and art walls. According to the Chronicle, in addition to the new facilities, the development would include a 12,000 square foot "Mary Square," and a 22,000 square foot green space on the Chronicle Building Roof. The project, which is facing heavy criticism from local neighborhood groups, is expected to get underway by 2016 or 2017 and phase in over about ten years. Public comments will be heard until December 1. Forest City said renderings should be available within about a month, so stay tuned.